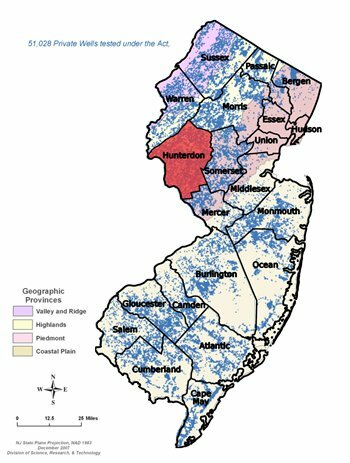 The Hunterdon County law requires specific testing of the well water for a variety of contaminants and chemical parameters where a Certificate of Occupancy is required. Testing includes a standard PWTA Parameter test (Total Coliform Bacteria, pH, Iron, Manganese, Lead, Arsenic, Nitrate, Volatile Organic Scan and Gross Alpha Analysis). The Hunterdon County Department of Health and New Jersey’s Department of Environmental Protection recommends that residents using private wells have them tested once a year to ensure the well is free from harmful bacteria. Additional testing of nitrate, arsenic and volatile organic compounds are recommended every five years.